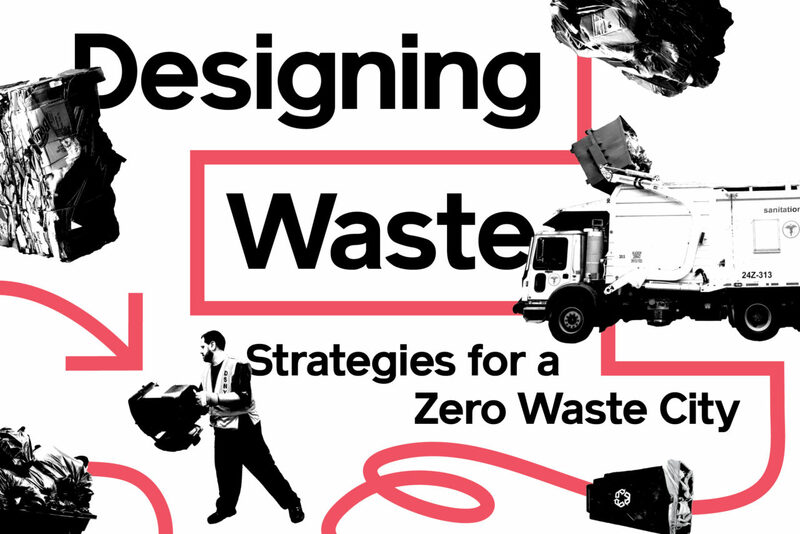 Designing Waste: Strategies for a Zero Waste City explores how we manage waste in our buildings and neighborhoods, and how design can help reduce the amount of waste that goes to landfill. Every day, tens of thousands of trucks filled with food, clothing, and other goods arrive in New York City to be delivered, unpacked, and consumed. And every day, approximately 24,000 tons of discarded materials leave the city as waste. Waste management costs New York City over a billion dollars every year. To combat this problem, the city announced a Zero Waste plan in 2014 to reduce the amount of discards sent to landfills by 90% by 2030. Designing Waste examines the architecture of New York City’s gray spaces for trash—the overlooked areas where waste is managed in our buildings. This is when waste is closest to us, when it’s sorted and stored in apartments, trash rooms, basement corridors, loading bays, and sidewalks. And this is where architects, designers, and building professionals have agency to transform the waste system. The exhibition is based on the Zero Waste Design Guidelines, an expansive document that examines architectural strategies for waste reduction. New Yorkers have learned to ignore trash. Other cities keep waste out of site in loading docks and alleyways. But New York’s buildings often sit square on their blocks, leaving little room for dumpsters. Cars are parked in tight lines, creating a barrier to the street. As a result, waste is usually piled in bags on the sidewalk and then tossed into trucks by sanitation workers. In the spirit of looking at the status quo with fresh eyes, you’re invited to post pictures of these piles on Instagram or Twitter, creating an archive of the city’s curbside condition. Using software developed by Luster, a Brooklyn­-based technology design company, photos posted with the hashtag #designingwaste will appear in the exhibition for its duration. Coinciding with Designing Waste, AIA New York will launch a Zero Waste Challenge. For the duration of the exhibition, and culminating in October 2018, the AIANY | Center for Architecture office will closely monitor its waste streams and amplify efforts to reduce overall waste generation. Zero waste stations will be located throughout the Center for Architecture, with one on display on the mezzanine level of the exhibition. Architecture firms throughout the city will be invited to join the challenge as well. Learn more about the challenge here.